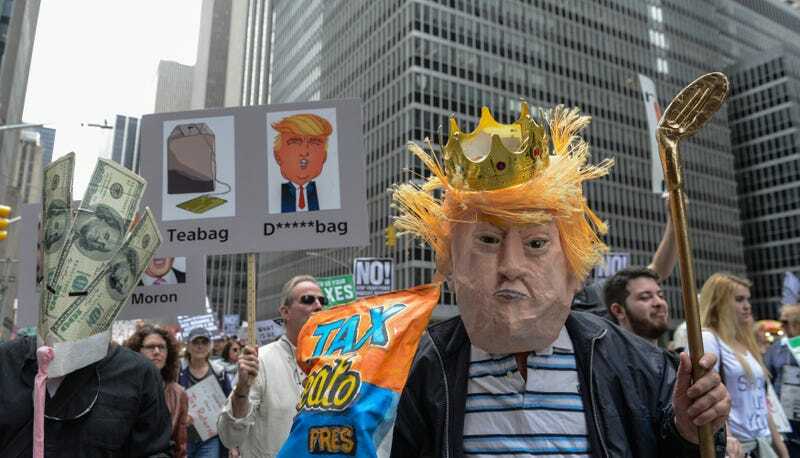 Tuesday is the deadline for taxpayers to file returns, so tensions are high nationwide, and the situation isn’t helped by the fact our president, a known liar and gilder of all things interior, has yet to release his tax returns. He will probably never change his mind about that or be held accountable in any meaningful way, but today thousands of people in nearly 150 cities (according to organizers) participating in the #TaxMarch demonstrated that the demand for the president to elaborate on his financial disclosures will not be vanishing anytime soon. Also, its can be pretty cathartic in times such as these to rage in the streets. In Chicago, and elsewhere, protesters paraded around this angry chicken wearing what appears to be a large, expensive turd on its head, much like a certain president of ours. Speaking of, in West Palm Beach earlier today, as protests were firing up throughout the country, our president reportedly enjoyed his 18th visit to a golf club since assuming office. Then he was driven back to Mar-a-Lago along a circuitous path so that his motorcade would avoid the unseemly sight of protesters.